We’d like to highlight another Kickstarter project, but this time it’s not a 3D printer. It’s something that 3D printing made possible. 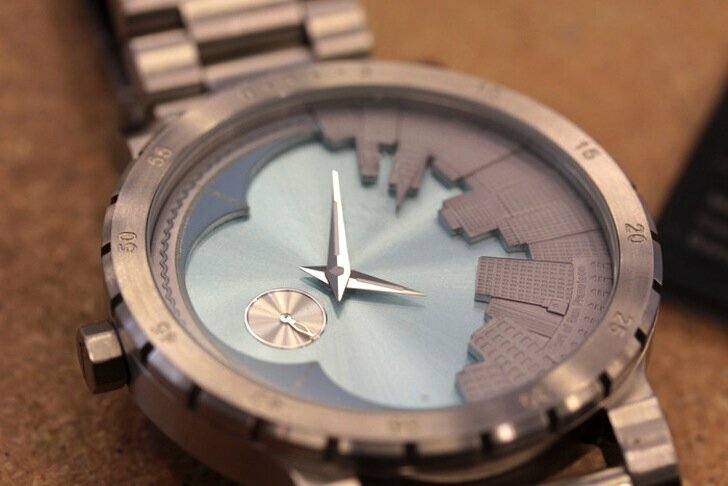 Paul Youngblood has a passion for watches and for cityscapes. He’s managed to put the two together in what is an already very successful Kickstarter project that is offering watches that have a three dimensional San Francisco skyline on their faces. The project has already surpassed its $15,000 funding goal, with 21 days remaining for you to drop by and choose a model for yourself. While he could conceivably have created the watches without 3D printing, in reality the project would never have gotten off the ground without the technology. He just could not find a good way to produce the skyline with any real depth, until he went the 3D design route at his local Techshop in San Francisco where he used their CAD programs, 3D printer and other machinery to come up with his prototype. The watches come with a day, night, or “high contrast” night skyline, with stainless steel, rubber or leather bands. There are also multiple sizes so all wrist sizes are accommodated. My favorite is the high-contrast night face with the stainless steel band. These appear to be high quality watches with Swiss movement, and carry a five-year guarantee. Pledging just $200 to the project will get you a watch, with other pledge amounts garnering other benefits that range from pledging one dollar to be invited to the release party in San Francisco to $5,000 for a 3-day trip to New York with him to design the upcoming NY model, and one of two serialized versions of that watch in a signed box. 3D printing — making entrepreneurs out of artists.